Seligpreisung ("blessed praising or songs of praise") has some very notable changes, and again it's a very different affair than what came before. Gone is Fritz Sonnleitner on violin and joining Conny Veit on electric guitar is Daniel Fichelscher from Amon Düül II playing electric guitar, drums and congas. Fricke guested on the 1973 album by Gila called Bury My Heart at Wounded Knee along with Veit and Fichelscher. This meeting with Fichelscher was a very important moment in the history of Popol Vuh, as he would become Fricke's longest-term collaborator. Djong Yun is also gone, and for the first time, Florian Fricke handles the vocal duties for the group. The addition of more traditional drums and congas changes the whole vibe of the music into something more rocking and alive. Without too much imagination, one could almost dance to some of these tracks. All songs are brilliant, perhaps none more so that then opening "Selig sind die, die da hungern," but truly a high standard is maintained throughout. In later years, Florian Fricke would regret singing on this album himself (Djong Yun was temporarily unavailable). The lyrics, however, like in most Popol Vuh music, just sound like another instrument. Fricke's voice is actually quite pleasant, adding a unique flavor to Popol Vuh that we wouldn't hear again for awhile. The last song on the album, "Ja, sie sollen Gottes Kinder heissen" is historically interesting. Here we hear for the first time a musical theme (this is the one I believe Florian Fricke refers to as "Little Warrior"18) that will be repeated on several subsequent albums, and is something that fans of larger parts of Popol Vuh's catalog will have noticed. The whole aspect of repeated musical themes is somewhat novel, bringing a continuing musical narrative throughout their career that most groups would never go near for fear of being redundant or accused of resting on their laurels. 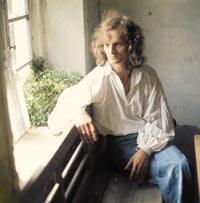 Popol Vuh makes this work in spades by adapting the repeated themes to the particular instrumentation and style of each album. Overall this is another soaring, beautiful, essential and seminal work, sounding not only unique in the world of music, but among all other Popol Vuh albums. You'll hear me say this several times, and really it's quite a trick to pull off. The only common complaint people have about this album is its length, clocking in at slightly under 30 minutes. I don't know about you, but I'd rather have 30 minutes of uplifting and regal music than 45 of common filler. Here the bonus track is the 4:59 "Be In Love," and it could almost be the B-side to Hosianna Mantra's bonus track "Maria (Ave Maria)." The instrumentation sounds virtually the same, including the gorgeous singing of Djong Yun. Another lost classic, and quickly here I'm understanding why these SPV CD releases are so valuable, the improved remastered sound notwithstanding. This period of Popol Vuh contained one classic album after another, and Einsjäger & Siebenjäger ("ones Soldier & seven soldiers") is no exception. Here we are pared down to the core of Popol Vuh, the musicians that would constitute the heart of the group for years; Florian Fricke, Daniel Fichelscher (who now plays electric guitar, acoustic guitar and percussion) and the return of Djong Yun on vocals. Olaf Kubler, another member from Amon Düül II, guests on flute. Fichelscher would have an enormous influence on the sound of Popol Vuh, especially now that that Conny Veit was gone, and Fricke seemed more than happy to let his musicians influence the music, whose visions seemed only to enhance his own. Here again we're treated to some of the best music ever to emerge from the "rock" genre, and there must have been a lot of overdubbing going on, as the drums, electric and acoustic guitars are often exhibited simultaneously, winding in and around each other in a magnificent way. Fricke's piano is much less to the fore here as in previous works, only emerging periodically to guide the way. Side one contains five shorter superb instrumental tracks. The only negative one could really come up with in the work of Daniel Fichelscher is perhaps his over-reliance of cymbal crashes as part of his drumming style. While this can occasionally wear, it also fits in with a style of music that ebbs and flows and continually goes for higher and yet still more dramatic highs. Nowhere is this demonstrated more than on the sidelong nineteen-plus minute track on side two, "Einsjäger & Siebenjäger." We are again joined by the occasional soaring vocals of Djong Yun, and this is the one track in Popol Vuh's entire career that comes closest to the realms of progressive rock in terms of structure. By the time it's over, one is left exhausted, yet exalted - another indispensable work from another near-perfect album. There are two bonus tracks on this CD. The first is the wonderful 1:55 "King Minos II," which oddly enough sounds nothing like "King Minos I" from Einsjäger, but more like a stripped down and shorter version of "Song of Earth" from their 1985 album Spirit of Peace. The second bonus track, the 5:42 "Wo bist Du?" is virtually identical to "Wo bist Du, der Du überwunden hast?" from the 1979 album Die Nacht Der Seele - Tantric Songs, which is odd to say the least. It's a beautiful song, though, so I'm not complaining. Das Hohelied Salomos ("the high song of Solomon") takes over from where Einsjäger left off. Again, we have the core three musicians along with guests Al Gromer (yet another Amon Düül II member) on sitar and Shana Kumar on tablas. The lyrics are by "King Solomon" and "arranged by Florian Fricke," and are essentially biblical verses of the Old Testament's King Solomon, son of King David. Fricke referred to this album as "a mystic love song dedicated to love. 19" As usual, Yun could sing anything and make it sound beautiful and angelic. Das Hohelied Salomos is made up of nine tracks, all of them less then 5 minutes, and all of it is wonderful. One could argue that unlike other albums of theirs where there was a very notable progression from album to album, here they appear to be standing still. While there is validity to that point of view, when music is this exciting and wondrous, I only wish they had made more albums that sounded this good. There's an odd quality on Das Hohelied Salomos, and it's how the songs seem to fade in and fade out. It's almost as if Popol Vuh had one massive recording session where they just jammed for hours and hours, spliced the best parts out and called them "songs." There are even parts where Djong Yun starts singing "Hosianna" as if we're hearing an outtake from the Hosianna Mantra sessions. While this is not the way these songs were recorded, it still comes off as snapshots into possible directions they tried out before choosing yet another direction. In the end, it hardly matters as you lose yourself in some of the most cosmic music this side of Venus. The first (of three) bonus tracks is the 2:10 "In den Nächten auf den Gassen III" (part I and II are on the proper album), and this song fits in perfectly with the rest of the album. The 2:45 "Sch�n bist Du vor Menschens�hnen (alternative Session)" is not as essential as many of the other bonus tracks, but an average Popol Vuh track from this period is better than most songs by almost anyone else. The third track, the 4:50 "Mitten im Gärten (alternative Piano Version)" is almost completely a solo piano Florian Fricke track, which makes it something special. There are many confusing aspects surrounding the various releases of Aguirre, so I'll try to simplify things as much as I can. Aguirre, the Wrath of God is a 1972 film by the famous German director Werner Herzog. This was the first of many collaborations between Fricke and Herzog, who were long term friends and colleagues. This album is sometimes considered a soundtrack album, but in reality only a small portion of it was used in the movie. 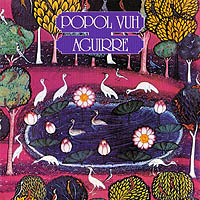 The album, featuring the core three musicians of Popol Vuh only, opens with the track "Aguirre." Though released in 1975, this is obviously a track that was recorded earlier since it showed up in the 1972 movie. If there was ONE track that could be considered a signature song by Popol Vuh, one song that could capture all the majesty and beauty they were capable of, this is it. To this day, the song remains a mystery. Is it a chorus? Is it keyboards? Was this produced by his Moog synthesizer or perhaps layer upon layer of sound from a mellotron? However it was created, it's a song of epic proportions, and perhaps the closest anyone has come to reproducing the sounds of the angelic kingdom on earth. Like in the movie, the song ends with some beautiful pan pipes before moving into the next track, "Morgengruss II," which is essentially the same track that appeared on Einsjäger & Siebenjäger simply as "Morgengruss." Fricke explained such incongruities by saying, "I don't make music for collectors; I make music for the people. When I release a piece that I love very much, be it in Germany, in Italy or in France, and the record company then changes or no longer exists, I see it as my right to use the piece and go to an American company where none of it has been heard. 20" That may or many not explain the duplication of the "Morgengruss" track, but ultimately "Morgengruss" is such an amazing track that they could have used it on every album and I never would have tired of it. We then move into "Aguirre II," which starts off as a retread of "Aguirre" with the beautiful choral sounds before shifting suddenly and euphorically into more of the elaborate winding acoustic and electrical guitar that made up "Morgengruss II." Finally, we are greeted by "Angus Dei," which harkens back more to the sound of Einsjäger, and is a fitting elegant end to yet another perfect album side, topping perhaps even the ultimate perfection of side one of Hosianna Mantra. Here's where things start getting really confusing. The original album contained those 4 tracks, and then the almost 17-minute sidelong track called "Vergegenwärtigung." Suddenly it sounds like we're back in the days of Affenstunde and In Den Gärten Pharos with an ambient gently vibrating Moog soundscape that from around the 6:45 second mark sound virtually identical to an extended section of the track In Den Gärten Pharaos, but without the percussion, and wafting in through the mix is a buried track under the surface containing the angelic voices from the "Aguirre" track, but you have to listen very carefully to hear it. This track was recorded around 1972 or so before Fricke abandoned his Moog entirely. It surely wasn't made when the album came out, as the big Moog was sold to Klaus Schulze in 1975. When the LP was re-released in 1982 on the Pop Import label, the 17-minute original "Vergegenwärtigung" track was gone, having been replaced by two tracks from the 1979 album Die Nacht Der Seele - Tantric Songs, and one track from the 1978 album Brüder Des Schattens - S�hne Des Lichts. The album failed to mention this though, and still called the track "Vergegenwärtigung," only now it clocked in at under 15 minutes. It has been surmised that the master tapes to that song were lost, hence three later tracks were sandwiched together to fill the space. This is the version of the album that I first knew, and I fell in love with it this way. Early releases of Aguirre on CD, however, contained only the first track "Aguirre," and then selections from either In Den Gärten Pharaos and/or piano tracks called "Spirit of Peace 1,2 & 3." Even the first release on the French label Spalax didn't get it right, and it wasn't until a second edition came out that a CD matched the Pop Import LP version. Naturally, I expected the SPV release to sound like the Pop Import version, since that's how I knew the album to be, not knowing that originally "Vergegenwärtigung" was a different song entirely, and so SPV is the only release on CD to finally get things right and have the album released in its originally intended form 30 years after the fact. I'm glad I still have the Spalax CD, for even though it's a copy of a "mistake," it's still a wonderful alternate version of the album. Another selling point of the Spalax CD is the inclusion of the three (almost 20 minutes) "Spirit of Peace" solo Florian Fricke tracks, part 2 of which appeared later on their Spirit of Peace album, and parts 1 and 3 of which are unavailable elsewhere. The SPV bonus track is a pleasure to hear, and it's none other than the 7:16 "Aguirre III." This is essentially an extended version of the "Aguirre" track without the pan pipe section at the end, and including added thundering bass drums and congas that only add to the drama of the original track. This is literally music that will make you fall out of your chair with its power. It's that good. Perhaps you've figured out by now that during these years Popol Vuh were incapable of making a wrong move, and the 1976 album Letze Tage - Letze Nächt ("last days - last nights") continues the trend. Joining the three core musicians on this album are Al Gromer on sitar, Ted De Jong on tamboura and yet still another Amon Düül II member, Renate Knaup adding additional vocals. From the opening note of this album, we know we're hearing something different. The music is heavier and more powerful. This is their ROCK album, or as close as Popol Vuh ever got to traditional heavy rock (which honestly still isn't that close). Gone is the fluid guitar of the Conny Veit days in favor of the harder rock guitar sounds of Daniel Fichelscher. The sounds here are more intense, even shocking upon first listening. It's a wake-up call and a definitive statement. On the third track, we're greeted with the mantra "Haram Dei Raram Dei Haram Dei Ra," which sounds like a Krishna chant - another religion touched upon, and in a very powerful way. The lyrics, repeated a few times, are simple and powerful. This is a very intense album that barely lets up for a second. While it's another exceptional must-own album, I don't necessarily see it as their highest pinnacle that some do. Still, its consistency and power is hard to deny. These people knew how to tap into the cosmic forces of the universe in a way no others could. The first and second bonus tracks, the 5:56 "Wanderschaft - Wanderings" and the 2:30 "Gib Hin (session version)" sound like outtakes from Das Hohelied Salomos, and it's more of their usual brilliance. The third track is the 6:32 "Haram Dei Ra (alternative version)" that has some truly unbelievable percussion and male vocals (is it Fricke?) singing the "Haram Dei Raram Dei Haram Dei Ra" mantra that the women sang on the proper album, along with some tasty electric guitar. Here we take a divergence of sorts. Is Yoga really a Popol Vuh album? Well, it depends who you ask. The facts are that it was released in 1976 on the Italian PDU label as a Popol Vuh album. In many fans hearts, like mine, it is a Popol Vuh album. Other salient facts, however, are that the album contains primarily Indian musicians with Florian Fricke playing only harmonium and organ. Essentially, Fricke produced music by some Indian musicians that visited him in his studio and someone took the tapes of this recording and released them under the Popol Vuh name without his permission. The fact that it contains only Fricke and other Indian musicians naturally makes it sound in no way like any other Popol Vuh album. In fact, it sounds like what it is, Indian music. That said, the two tracks, "Yoga 1" (22:00) and "Yoga 2" (18:21) are really pretty amazing pieces of music and the album is well worth owning. There are some female vocals at the beginning of "Yoga 1" and at the end of "Yoga 2," but it's mostly an instrumental album filled with wonderful sitar, tablas and other classical Indian instrumentation. Understandably, due to the circumstances of its original release, SPV passed on re-releasing this. The Spalax CD might still be able to be found, however, and it's had other released versions on CD as well. Coeur De Verre ("heart of glass") is another Werner Herzog soundtrack. For his soundtracks, Herzog tended to obtain music from Popol Vuh that had already been recorded and fit them into his movies, as opposed to all of the music being specifically recorded for the movies. This led to what I consider to be a significantly higher quality of music, that is to say, music worthy of the Popol Vuh name, whereas other artists who record soundtrack music often have those pieces considered to be lesser works. This was the first album (Yoga notwithstanding) for a little while without Djong Yun. The music doesn't suffer, however. Fricke is still accompanied by Daniel Fichelscher, and is also joined by Mathias von Tippelskirch on flute and again by Al Gromer on sitar. This album is a distinct turning away from the overt heaviness of Letze Tage - Letze Nächt into something with a bit more subtlety, yet retaining the intensity of the former. There are pieces like "Huter der Schwelle" that capture the feel of Letze Tage, but mostly this is music that takes time to build, none more so than the superlative opening track "Engel der Gegenwart." Every song on the album is enjoyable, however, and this is a decidedly more mature work than what had come before, another step in their continual growth and progression, and another must-own. Both bonus tracks, the 4:42 "Auf dem Weg - On the Way (alternative Guitar Version)" and the 5:44 "Hand in Hand in Hand (Agape Guitar Version)" sound like nice alternate shorter versions of would later be "Take The Tention High" from their 1985 Spirit of Peace album.